Western blot analysis of extracts from 293T cells, mock transfected (-) or transfected with a construct expressing Myc/DDK-tagged full-length human Semaphorin-4D/CD100 protein (hSema4D-Myc/DDK; +), using Semaphorin-4D/CD100 (E5C3B) XP® Rabbit mAb (upper), DYKDDDDK Tag Antibody #2368 (middle), and β-Actin (D6A8) Rabbit mAb #8457 (lower). Western blot analysis of extracts from various cell lines using Semaphorin-4D/CD100 (E5C3B) XP® Rabbit mAb (upper) and β-Actin (D6A8) Rabbit mAb #8457 (lower). As expected, Semaphorin-4D/CD100 protein is not expressed in PC-3 cells. 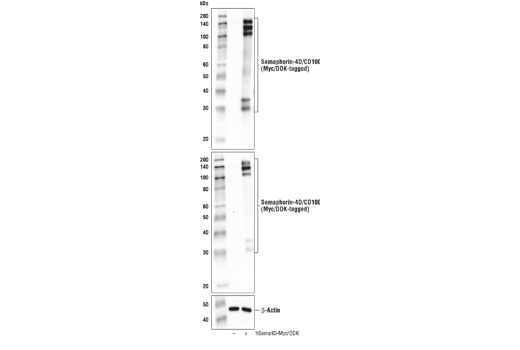 Western blot analysis of extracts from various cell lines using Semaphorin-4D/CD100 (E5C3B) XP® Rabbit mAb. Immunoprecipitation of Semaphorin-4D/CD100 from HDLM-2 cell extracts. Lane 1 is 10% input, lane 2 is Rabbit (DA1E) mAb IgG XP® Isotype Control #3900, and lane 3 is Semaphorin-4D/CD100 (E5C3B) XP® Rabbit mAb. 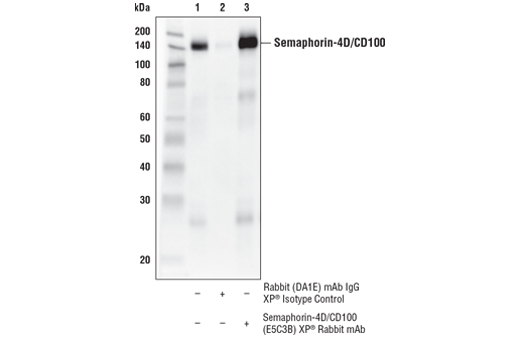 Western blot analysis was performed using Semaphorin-4D/CD100 (E5C3B) XP® Rabbit mAb. Mouse Anti-Rabbit IgG (Conformation Specific) (L27A9) mAb (HRP Conjugate) #5127 was used for detection to avoid cross-reactivity with IgG. 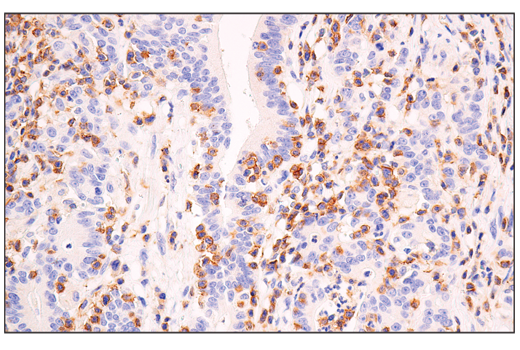 Immunohistochemical analysis of paraffin-embedded human uterine papillary serous carcinoma using Semaphorin-4D/CD100 (E5C3B) XP® Rabbit mAb performed on the Leica® BOND™ Rx. 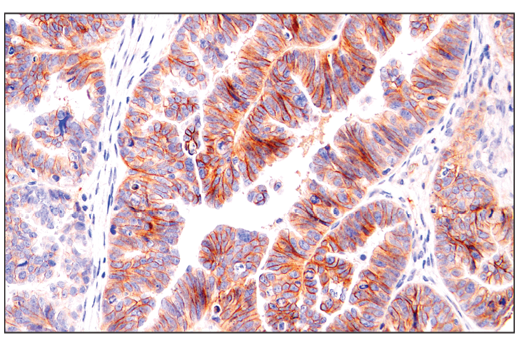 Immunohistochemical analysis of paraffin-embedded human gastric adenocarcinoma using Semaphorin-4D/CD100 (E5C3B) XP® Rabbit mAb performed on the Leica® BOND™ Rx. 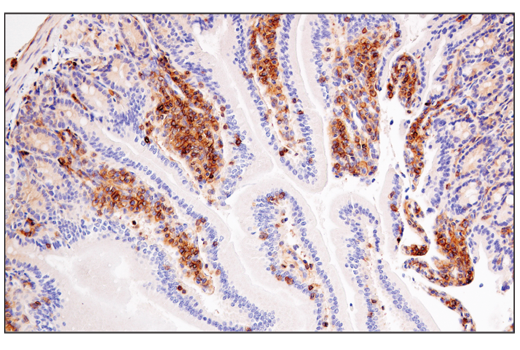 Immunohistochemical analysis of paraffin-embedded human appendix using Semaphorin-4D/CD100 (E5C3B) XP® Rabbit mAb. 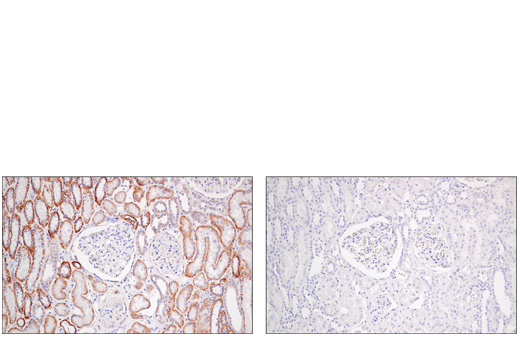 Immunohistochemical analysis of paraffin-embedded human kidney using Semaphorin-4D/CD100 (E5C3B) XP® Rabbit mAb (left) compared to concentration matched Rabbit (DA1E) mAb IgG XP® Isotype Control #3900 (right). 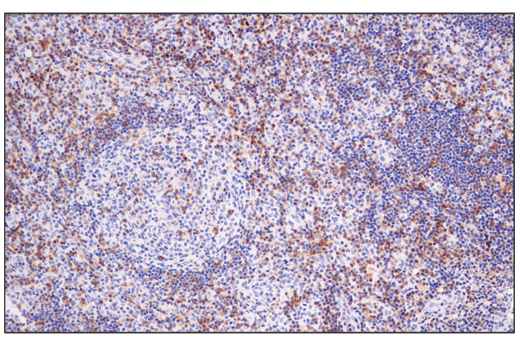 Immunohistochemical analysis of paraffin-embedded human non-Hodgkin's lymphoma using Semaphorin-4D/CD100 (E5C3B) XP® Rabbit mAb. 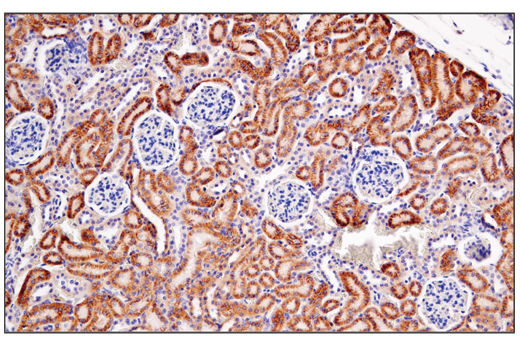 Immunohistochemical analysis of paraffin-embedded mouse kidney using Semaphorin-4D/CD100 (E5C3B) XP® Rabbit mAb. 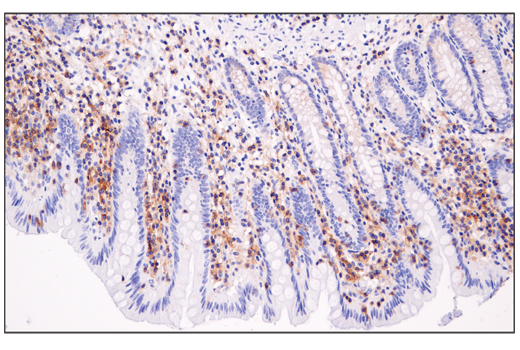 Immunohistochemical analysis of paraffin-embedded mouse small intestine using Semaphorin-4D/CD100 (E5C3B) XP® Rabbit mAb. 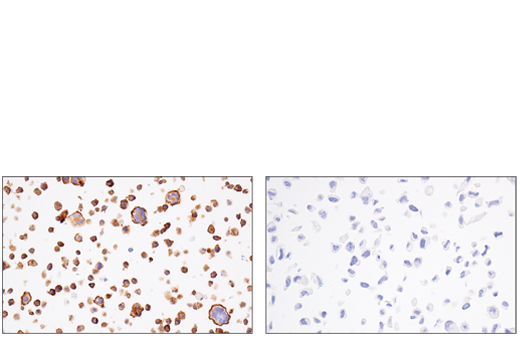 Immunohistochemical analysis of paraffin-embedded HDLM-2 cell pellet (left, positive) or PC-3 cell pellet (right, negative) using Semaphorin-4D/CD100 (E5C3B) XP® Rabbit mAb. 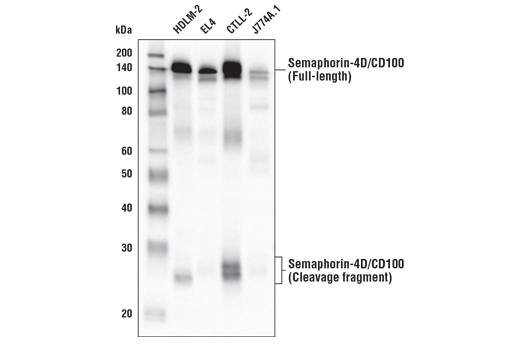 Semaphorin-4D/CD100 (E5C3B) XP® Rabbit mAb recognizes endogenous levels of total Semaphorin-4D/CD100 protein. 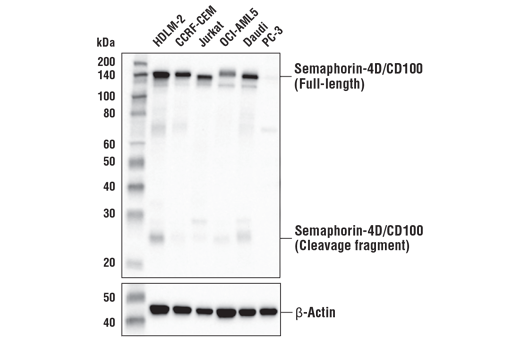 This antibody also recognizes a 25 kDa Semaphorin-4D/CD100 cleavage fragment containing the carboxy terminus. Monoclonal antibody is produced by immunizing animals with a synthetic peptide corresponding to residues surrounding Gly814 of human Semaphorin-4D/CD100 protein. Semaphorin-4D/CD100 (Sema4D) is a disulfide-linked homodimeric type 1 transmembrane glycoprotein belonging to the class IV family of membrane bound semaphorins. The extracellular domain of Sema4D contains a cysteine-rich semaphorin-like domain, an Ig-like domain, and a PSI domain (1). Research studies have suggested that the cytoplasmic domain has a signaling function as it is phosphorylated on serine residues (2). Initial studies involving Sema4D revealed that it was implicated in axon guidance within the central nervous system through binding its high affinity receptor, plexin-B1 (3). Sema4D function has also been extensively characterized in the immune system and is the first semaphorin found to be expressed on the surface of many types of immune cells (4-6). In the immune system, CD72 serves as a low-affinity receptor for Sema4D (7) and research studies have shown that Sema4D not only regulates T-cell activation (8,9) but is also involved in the regulation of B-cell survival and differentiation (10). Many of the physiologic effects of Sema4D in the immune system are regulated by a soluble extracellular domain-containing fragment generated through proteolytic cleavage (11). Sema4D has also been implicated in oncogenesis as research studies have demonstrated overexpression in multiple types of solid tumors (12,13). The role of Sema4D in oncogenesis, in part, has been linked to its ability to promote tumor angiogenesis (14), cell invasion (15), and immunosuppression through enhancement of myeloid derived suppressor cell function (16). Love, C.A. et al. (2003) Nat Struct Biol 10, 843-8. Elhabazi, A. et al. (1997) J Biol Chem 272, 23515-20. Kolodkin, A.L. et al. (1993) Cell 75, 1389-99. Bougeret, C. et al. (1992) J Immunol 148, 318-23. Hall, K.T. et al. (1996) Proc Natl Acad Sci U S A 93, 11780-5. Furuyama, T. et al. (1996) J Biol Chem 271, 33376-81. Kumanogoh, A. et al. (2000) Immunity 13, 621-31. Hérold, C. et al. (1995) Int Immunol 7, 1-8. Jiang, X. et al. (2017) Front Immunol 8, 765. Elhabazi, A. et al. (2001) J Immunol 166, 4341-7. Chen, Y. et al. (2012) Int J Mol Sci 13, 13264-74. Liu, H. et al. (2014) Microvasc Res 93, 1-8. Basile, J.R. et al. (2006) Proc Natl Acad Sci U S A 103, 9017-22. Kato, S. et al. (2011) Cancer Sci 102, 2029-37. Younis, R.H. et al. (2016) J Immunol 196, 1419-29.